Marine Composite Squadron Two (VMCJ-2) based at MCAS Cherry Pt. N.C. was the Eyes and Ears of the 2nd Marine Aircraft Wing from 1955 until 1975 flying photo reconnaissance and electronic warfare aircraft. In addition to its operational mission it was also responsible for replacement aircrew training for VMCJ-1 which was permanently deployed to WESTPAC in 1960. Castro’s Cuba became VMCJ-2’s sandbox back in 1960 shortly after his revolutionary government began receiving military aid from the Soviet Union. For 15 years Cuba would be the geographic backdrop for execution of both of the squadron’s missions. VMCJ-2 was the first Marine Corps unit to receive the Navy Unit Commendation in peacetime for aerial reconnaissance operations over and around Cuba from 1 September 1960 until 1 December 1962, culminating with the Cuban Missile Crisis. During the famous 13 days of October and beyond, VMCJ-2 provided four RF-8A Crusaders and pilots to augment VFP-62 for the crucial low level photo missions that tracked the Soviet nuclear armed ballistic missiles as they became operational and then their subsequent dismantling and removal under the Kennedy-Khrushchev pact. In addition, the squadron’s EF-10Bs kept tabs on the air defense radars from Key West, and another RF-8A detachment was deployed to Guantanamo Bay to support base defense efforts much as they had during the two previous years of the massive Soviet military buildup in Cuba. I well remember those uncertain days of October 1962 as I was then a senior at the University of Florida awaiting graduation the following Spring and receiving a commission as a 2nd Lieutenant in the Marine Corps. With that doomsday averted, I entered active duty and after attending the Basic School went on to Pensacola for nugget training as one of the Marine Corps’s first Naval Flight Officers. After basic NFO school, I was selected for further training as an Electronic Countermeasures Officer (ECMO), supposedly to be one of the first to fly the new EA-6A Electric Intruder. In 1964 when the program slipped I found myself checking out in the venerable EF-10B Skyknight in VMCJ-3 at MCAS El Toro. Then a thing called the Vietnam War happened and we deployed to Danang in October 1965 to become VMCJ-1. After 13 months supporting TF-77 and 7th AF operations over North Vietnam I caught a break with a set of orders to Hawaii to become a plank owner in the CINCPAC Joint Reconnaissance Center, a 3 year tour. My time there was most interesting to say the least as not only did we have our hands full with operations over Vietnam, but during my watch the USS Pueblo was captured and a VQ-1 EC-121 was shot down by the North Koreans. I mention this as background for a little known incident during my follow-on assignment to VMCJ-2. I was a captain when I joined VMCJ-2 in January 1970 for transition training in the EA-6A prior to going back to WESTPAC. Later that Spring I was joined by Lt. Colonel Chuck Houseman, a veteran VMCJ pilot who was enroute back to Vietnam before becoming the CO of VMCJ-1 in Japan in 1971. By the end of April, we both had accumulated a good bit of time in the aircraft and as one of our last training events we were assigned to lead a section of EA-6As down to Key West for a couple of days to fly ELINT training missions around the periphery of Cuba. 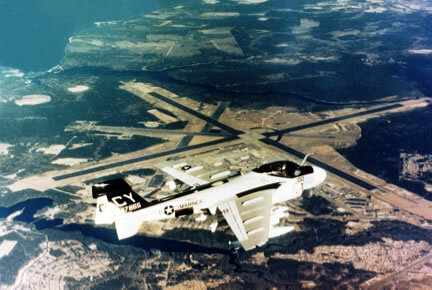 These missions had long become routine as VMCJ-2 had been flying them to keep track of Castro’s air defense radars and provide ECMO training since 1960. This one turned out to be far from routine! Our skipper, Lt. Colonel Jimmy Green, was fortunate to have a sharp and rather aggressive squadron air intelligence officer as his S-2 who was on top of the military situation in Cuba. He had been monitoring the increased message traffic regarding Cuba taking part in OKEAN-70, the Soviet Navy’s first ever global exercise involving over 200 ships. A Soviet task force had been operating out of a Cuban port and a series of TU-95 Bear flights to and from Cuba from the Kola Peninsula had been reported. Although the Soviet pilots had left Cuba in 1963 after turning over their MiG-21s to the Cubans, Castro’s fighter pilots were by 1970 reasonably well trained. They had also gotten more aggressive as just a few days before our mission some of his MiGs had intercepted a civilian light plane that had wandered into Cuban air space. We learned later that there was some background chatter about Castro itching to flex his muscles with some kind of air Pueblo-like incident. The day before we were scheduled to depart for Key West, the S-2 approached the CO with his concerns that the Cubans might consider our flights during the OKEAN exercise as provocative and cause some kind of trouble. He also reminded him of a provision in the CINCLANT order covering our “training missions” for fighter escorts to be assigned at the discretion of the CG 2nd MAW, something that had never been done before. The next morning they briefed the CG, his G-2 and other key staff. The CG at that time was Maj. Gen Marion Carl who was not one to back off from a challenge and quickly okayed tasking MAG-31 at MCAS Beaufort to provide us fighter escorts. Aside from his heroics as a medal of honor winning fighter pilot in WW II, General Carl allegedly flew some rather interesting photo missions in Banshees over the coast of mainland China right after Korea while he was CO of VMJ-1. To MAG-31 this had to be both good news and bad news. In 1970 after 5 years in Vietnam concentrating on CAS missions our F-4 community had about lost its base of experience in air-to-air intercepts and full mission capable aircraft was a rarity. However, just the thought of having a remote chance to engage a Cuban MiG put the fighter jocks into a frenzy and they quickly adopted VMCJ-2’s “Can Do Easy” motto! The VMFA-451 Warlords were tasked to support us and received the word while at a squadron beer bust to get four aircraft with missiles at the ready down to Key West ASAP. The squadron had just transitioned from F4Bs to F4Js and beset with the attendant training and maintenance problems had to scramble to coble together four up aircraft and weapon systems. Chuck and I arrived in Key West as a single ship around noon as our wingman went hard down in the chocks at Cherry Point. The VMFA-451 aircraft didn’t make it until later that evening, and Chuck recalls some of the flight crews only had tennis shoes as they didn’t have time to go home after being recalled from the squadron party. Needless to say our Marine gaggle arriving unannounced caused a lot of consternation with the tenant activities. We were summoned to report to the CO of the Joint Air Reconnaissance Control Center (JARCC), an Air Force Colonel, who was really ticked off about the Marines bringing in fighter escorts. He had not been briefed on the possibility of a Cuban reaction to our missions, and just saw us as complicating his life. Finding we were acting with written authority, he instructed us all to show up early the next morning for a briefing by his controllers on exactly how they would require our missions to be conducted so we didn’t screw up as he put it. Upon arrival the Marine Phantom crews were being grilled by their hosts VF-101, the resident Navy F-4J RAG who had been maintaining a 24/7 strip alert for some time. The Navy didn’t buy the need for our CAP, and I guess their questioning led to a rather heated exchange with the Marines who wondered which side they were on. When order was restored, the Navy CO advised the Marines that he was confident they could handle anything the Cubans put up but if the Marines were hell bent on flying a CAP the next day he’d loan them some good missiles and get his avionics types to help get their systems up and ready that night. We were tasked to fly missions in the morning and afternoon on our pre-approved tracks at 25,000 feet that required us to come no closer than 20 nautical miles to the Cuban coast. Our track would first take us down the length of the island on the North side where we would reverse course and fly back to a turn point off Havana, then onto our Southwest leg down to the Western tip, reversing back to the turn point off Havana where we would head back to Key West some 90 miles away. Due to fuel limitations the Marine F-4s were to split into two sections and directed to operate from orbits assigned by the JARCC instead of following us in trail. As briefed we were assigned a different controller and radio frequency from the fighters, but the JARCC plan was for the fighters to be switched over to our frequency in the event of any trouble. The morning mission went down more or less as planned with no reaction by the Cuban Air Force. I recall detecting a couple of fire control radars along with the usual early warning and GCI radars we expected to see. In the afternoon again everything seemed okay as we approached the last turn point off Havana to turn North for home. The EW/GCI radars were again very active throughout the mission so there was no doubt we were being actively tracked by the Cubans. As we came abreast Havana it was bright and clear and at our altitude I could almost pick out the San Antonio de los Banos MiG base Southeast of the city. Within minutes after turning North for Key West we got a call from our JARCC controller advising we had “strangers” at six o’clock at 10 miles!! Needless to say this rang our bells and we began calling for more info and got it with a higher pitched voice telling us that the so called strangers were now at 5 miles and closing! Chuck had already picked up our speed and started a weave so we could get a better look behind us. At this call he chopped the throttles and went for the deck in a serious defensive maneuver and then firewalled the engines as we ran for home low over the water. 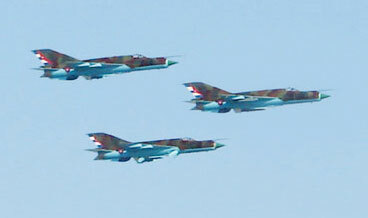 We got a glimpse of our adversaries flashing by over us, Chuck recalls there were 3 but I only saw two delta wing Mig-21s. All this time we were screaming at the controller who had gone silent asking where our CAP was as the F-4s should have been immediately switched over to our frequency. Minutes later we were back within sight of Key West where we landed forthwith, never hearing from the fighters!! Chuck climbed out of the aircraft and commandeered a vehicle to take him straight to the JARCC where he found a rather shook up colonel who had lost his “I am in control here” attitude and was hard pressed to explain what had gone wrong. Turns out his senior controller had been on the golf course leaving our “routine” missions to junior controllers. I joined up with the VMFA-451 crews who were equally upset and we all gathered in a rather chaotic JARCC conference room with everyone yelling at each other it seemed. I found myself gesturing with my hands like some kind of top gun. From the debrief we found that our F-4s had just made their section turnover with their drop tanks still on when their controller gave them a vector and told them to go to burner without saying why. They soon were going too fast to jettison their tanks and found they were being vectored in on a flight of MiG-21s who by that time were racing back to Cuba flying straight and level. The F-4 lead rolled in on the tail end Charlie and got a Sidewinder growl while asking for instructions never having heard any of our frantic radio calls. At this point, as we were clear the JARCC was not about to give them the order to fire and they broke off and headed back only to then find out that we had been intercepted. The JARCC track on the MiGs showed them well inside our ADIZ after overshooting us and turning back South. We were told later that the MiGs had been cleared to fire but never found out for sure. In any event Castro got a little revenge on one of the squadrons that exposed his missiles to the world, and Chuck and I have the dubious distinction of being intercepted by his MiGs inside our own ADIZ. Needless to say there were high level phone calls and message traffic going all the way up and back to Washington with more questions than good answers forthcoming. The upshot was we returned to Cherry Pt. that night and the squadron didn’t fly any more Cuba missions for a while. They never again had fighter escorts. Unbeknownst to us we picked a bad day to be involved in an international incident or then again maybe not as things quieted down fast. Turns out that President Nixon that very day had announced our incursion into Cambodia and the press was all over him. On the following Monday (4 May) the Time magazine cover story was about the Soviet government –by- committee which had just celebrated the anniversary of Lenin’s rise to power, and the increasing menacing Soviet military activity in the Western hemisphere. In fact they were already planning to build a nuclear submarine base at Cienfugueos which later in the year nearly caused a repeat of the 1962 missile crisis. Of note, just two weeks after our incident Castro sent a flight of MiG-21s over the Bahamas to intimate the island government who was detaining some Cuban fishermen. As an epilogue, as I was writing this article in December 2008 it appears to be de je vu all over again as the Russians were talking about sending strategic bombers in and out of Cuban air bases and their Navy sent a mini-task force to exercise with the Venezuelans, visiting Cuba on the way back. Colonel Whitten was designated as a Naval Flight Officer in 1964 with Electronic Warfare specialty. He was one of the first career officers to receive the NFO designation without first serving in another occupational specialty. He served in all three VMCJs and flew 175 combat missions in Vietnam in EF-10Bs with VMCJ-1 in 1965-66 before completing a tour at the CINCPAC Joint Reconnaissance Center. After transitioning to the EA-6A, he served as the 1st MAW EW officer in 1970-71 where he coordinated deployment of a VMCJ-1 EA-6A det to HMAS Norwa in Australia to support a RAN exercise in February 1971. He subsequently coordinated 3 quick reaction deployments of VMCJ-1’s EA-6As from MCAS Iwakuni, Japan back to Danang, RVN in support of TF-77 strikes against North Vietnam while Lt. Colonel Houseman was CO. Colonel Whitten was EW program requirements officer on the staff of the DC/S Aviation during the introduction of the EA-6B Prowler into the Marine Corps in 1977. He transitioned to the EA-6B in VMAQ-2 in 1979 becoming the first of only two ECMOs to fly all three of the Marine Corps jet EW aircraft. He later commanded a squadron and served as the executive officer of MAG-12. Colonel Whitten was a project officer at NAWC, Pt. Mugu, EA-6A/B Class Desk Officer at NAVAIRSYSCOM, and the DC/S Operations for the Marine Corps Development Center before retiring in 1988. After leaving active duty, he joined TRW, later Northrop Grumman Mission Systems, serving as project manager for tactical intelligence and mission planning systems and later in business development before retiring in 2003. Colonel Whitten is now living in the Tampa area but spends much of his time with his wife Yvonne of 46 years at their farm in North Florida where they raise beef cattle. He is currently president of the Marine Corps Aviation Reconnaissance Association (MCARA) and unofficial historian and chief contributor to its website at www.MCARA.us .